Henry Moore was the son of an English coal miner in Yorkshire. Entering art school at the end of his service in World War I, Moore developed under the influence of modern and ancient sculptural traditions, especially figures of pre-Columbian Mexico and African masks. His mature style emerged during the 1930s as a dynamic synthesis of abstract and surrealist dimensions. At this time, he wrote, "Beauty, in the later Greek or Renaissance sense, is not the aim in my sculpture. Between beauty of expression and power of expression there is a difference of function. The first aims at pleasing the senses, the second has a spiritual vitality which for me is more moving." After World War II, Henry Moore’s art became increasingly representational. A contemporary critic observed that this bronze figure of a woman from the late 1950s possesses the idealized grandeur of ancient statuary. Moore was now fascinated by the ways drapery could be used to express sculptural volume, and he closely studied figures from Greece and Rome. Delicate folds cling to the woman’s body like wet fabric, emphasizing the tensions of the underlying form pressing against them. 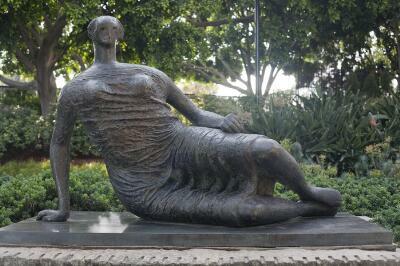 The reclining female preoccupied Moore throughout his long creative life.